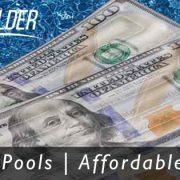 Choosing the right pool builder. This is part of the qualifying process and thought process of buying a new pool, don’t worry it’s not a dumb question. 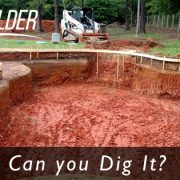 Let us help you sift through the noise of whats out there, and help put together this swimming pool construction puzzle. Before picking up the phone book (if you still use that old thing), checking online, or asking around let’s take this topic right from the start. What type of pool do you want to build? 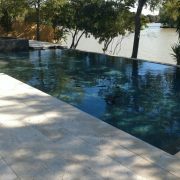 Make sure the contractors you are calling on are specialized in building the type of swimming pool you are looking for. The 3 different types of pools; gunite, fiberglass, and vinyl swimming pools require different approaches to the construction process. You want to make sure that the company you choose is specialized for installing the type of pool you’re after. We prefer the superior durability and longevity of gunite swimming pools, also known as concrete pools. Gunite pools have endless opportunities for design, size, shape and depth if you can just imagine the possibilities of creating any pool shape you can dream of. However, there are obviously alternative swimming pool structures offered for those with a different budget such as vinyl liner pools and fiberglass. 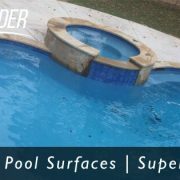 The later mentioned types of pools do not posses near the same amount of design customization features, shapes, and available upgraded pool equipment options, and not to mention they usually will not include a lifetime warranty. This is why we strongly suggest building a swimming pool in Montgomery County Texas with gunite material. The lowest bidding contractor may consequently provide less gunite, less steel rebar, only one skimmer, bottom drains that tie into the single skimmer line, not provide footings for the decking, mix match your pool equipment for shopping on the cheapest products, or even going bust on your project due to lack of funds! We have seen it happen many times. We have seen a low bidding pool contractor who will lower the price at a moments notice to be awarded the job, beware of this tactic. It leaves one to wonder how much “fluff” or “padding” was originally in the bid, and what exactly are they taking away from the pool design if they lower the price but nothing else changes? This is no situation a new pool owner should find themselves in. In comparison, the higher bidding pool contractor better have much rhyme-to-reason for the final price with the ability to show and explain why such a price point has been reached. From the technical details to the design & construction challenges, and also itemizing the additions or extras. In all cases, “it costs what it costs to build your pool”. A qualified swimming pool builder will not work for free, their experience is hard earned and just as your’s, their time is valuable and they do this for a living. 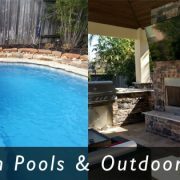 Ultimately there is no specific number of pool builders you must call to get all of the information that you are looking for, you would need at least 3 to make an apples to apples comparison and average out the total cost of an in-ground gunite swimming pool in Montgomery County TX. The key factor for proper comparison is knowing the details. Are you looking at a quote with just one total number for a pool without a breakdown of the cost, or are you able to see where your money is going? Who was the most informative & educational? Who provided references without having to ask? Who listened to my needs the most? Who seemed to be the most confident when answering my questions? Who does NOT ask for a deposit on signing? Who is transparent with details about the design, construction, pricing, funding options, the process, and caring for your pool after completion? Who focuses on ease-of-use and with prolonged service in mind from the start of the design? Who does not require money down to start your project, even if they have to pay for permitting fees to get started, this will help show they have financial stability. 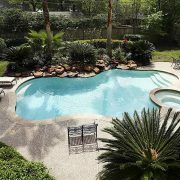 No obligations – Yep, you get a customized pool design specifically tailored to your requests and property dimensions. 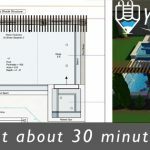 Standard practice all of our pool designs are created using CAD software and presented to you in video format. Adding to the immersion of your pool design we can even include 360 video so that you can immerse yourself in the design right in your backyard! Streamlined communications – makes the overall design process happen much faster for you. Personalized support – You will be working with a dedicated design professional with over 8 years of admirable pool design experience! Communications – We work as a team, and our project managers and engineers aide in the design support and cost analysis during the design process. Can excavators access my property to dig my new pool? How long are pool design meetings?